England-only votes: What are the options? With the Scottish Parliament set to get more powers following the country's rejection of independence, what are the chances of wider change across the UK, including the idea of "English votes for English laws"? Scotland voted against independence, but is still being promised more of a say over its own future. This has led people in other parts of the UK to question whether they too should have more control over their own affairs. Four options for "English votes for English laws" have now been put forward. Three of them are Conservative proposals, one has been put forward by the Liberal Democrats. A separate Lib Dem plan to establish a grand committee of English MPs, with the right to veto legislation applying only England, with its members based on the share of the vote. But don't we already have MPs to speak and vote for us? Yes, but there's growing disquiet about the way the current set-up works, among both the public and MPs themselves. Despite the devolution of powers to Scotland in the late 1990s, Scottish MPs at Westminster can still vote on issues affecting England only, such as its health and education policies. English MPs have no such power over Scotland. This constitutional anomaly - known as the "West Lothian Question" - vexes many voters and MPs, particularly those on the Conservative benches. Currently 41 of Scotland's 59 MPs are Labour, 11 are Liberal Democrats and just one is a Conservative. Many English politicians say reform is needed. It's hard to say. This is because the effects of a law can extend to other areas even if it does not directly apply there. The McKay Commission, which carried out a review of the West Lothian Question for the government, said there were many ways laws applying only in England, or England and Wales, could still have "consequential effects" in the devolved nations. For example, there is a tradition of "parity" between a devolved administration and Westminster in some policy areas, for example social security policy in Northern Ireland. This is why Commons Leader William Hague said "a very large proportion" of bills currently before the Commons could be affected. The government's report says such decisions could be "technically complex and subject to political debate", suggesting the matter is decided either by the Speaker or through a Commons vote. Why is this all coming to a head now? The three main Westminster parties agreed to give "extensive new powers" to the Scottish Parliament on issues such as tax and welfare if the country's voters rejected independence in the referendum. Scotland's voters opted to stay part of the Union in the referendum, meaning the Conservatives, Labour and the Liberal Democrats are duty-bound to follow up on their pledges. 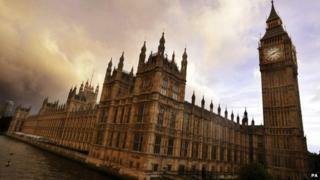 A draft parliamentary bill is being promised by the end of January. A commission set up to examine the issue has recommended handing more control over income tax to the Scottish Parliament - including the power to set rates of income tax and thresholds at which these are paid for the non-savings and non-dividend income of Scottish taxpayers. The commission also suggested devolving other taxes, including air passenger duty. In addition, the Scottish Parliament would be able to agree the franchise for its own elections, meaning 16- and 17-year olds will be given the vote. The Scottish Parliament already has powers over health, education, the environment and law and order. But many politicians in England, particularly Conservatives, are concerned that this makes it even more pressing that Scottish MPs should stay out of English affairs. Some, it is feared, might vote against Scottish devolution plans if they don't get some movement towards change in England. What is the Conservative leadership saying? Just minutes after the outcome of the Scottish referendum was announced in September, David Cameron vowed to fulfil the pledge of new powers for Scotland but also said talks on a new settlement for England should take place "in tandem". The prime minister has argued that, when the further Scottish changes come in, Scottish MPs should lose the right to vote at Westminster on issues that affect only England. He asked Mr Hague to draw up plans for reform. Mr Hague's proposals do not go far enough for some Conservative MPs, who argue that it will still hand too much influence to MPs for Scottish seats in the final Commons vote. Party leader Ed Miliband would have more to lose in parliamentary terms if Scottish MPs are stripped of the right to vote over England-only matters, which would make it harder for any Labour government to get legislation through Parliament. He disagrees with the prime minister, saying his plans risk creating "two classes of MP". Instead he is calling for a cross-party constitutional convention to take place, but not until after the election. This would, he says, take a wider, longer-term look at the situation facing the whole UK. Labour has said it would back giving English MPs greater say over legislation related only to England, by introducing a new committee stage in the legislative process open only to MPs from English constituencies. The opposition also wants to see devolution within England to regions and the House of Lords to be replaced with a "Senate of the Nations and the Regions". Leader Nick Clegg says there need to be changes to the rules at Westminster to ensure a great say for English MPs over English-only laws - his suggestion is that legislation would go through a committee of English MPs. The Lib Dems also favour more local devolution - or "devolution on demand" - with powers transferred from Westminster to cities, councils or groups of councils. The party also proposes a commission to explore future devolution options within England. So, would this mean an English parliament? At the moment, no. None of the three largest Westminster parties propose setting up an entirely separate body designed solely to create laws for England, as has long been demanded by the small English Democrats party and some Tory backbenchers. But the UK Independence Party does want to see an English Parliament - leader Nigel Farage has also written to Scottish MPs asking them not to vote on England-only issues. Will there be more powers for England's regions? Possibly. The three main parties all say they want the regions - some with populations larger than Scotland's - to have more say over how they are run. Mr Clegg has backed a report calling for large "city-regions" to get tax-raising and spending powers, with elected mayors at the helm. Labour and the Conservatives say they too want power to be decentralised. But creating extra tiers of government has not proved popular with the English public. When 10 cities held a referendum on whether they wanted elected mayors in 2012, only one - Bristol - voted in favour. Similarly, voters in north-east England rejected setting up a regional assembly by 78% to 22% in 2004. Can the parties reach a deal on England? They all said they could, but it is pretty clear that the answer is no. Labour has declined to take part in Conservative-led talks which they say are a "stitch-up". Instead it looks like each will put forward their proposals to voters at next May's general election. And what about Northern Ireland and Wales? Scottish Independence: How will Labour deal No vote fallout?